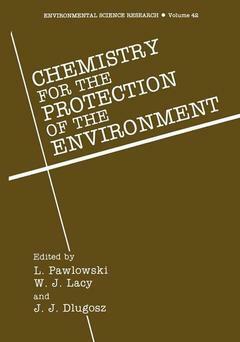 Coordinators: Pawlowski Lucjan, Lacy William J., Dlugosz J.J.
General Problems: Ground Water Pollution, A.L. Kowal. Hydrologic and Geochemical Implications of Waste Disposal Scenarios, M.S. Bedinger. Monitoring Methods for Surface and Ground Water and Analysis of Pollutants: Remote Water Quality Monitoring with an Airborne Laser Fluorosensor, M. Bristow, et al. An Overview of Advanced Spectroscopic Field Screening and In-Situ Monitoring Instrumentation and Methods, D. Eastwood, et al. Pathways of Chemicals in the Environment: Environmental Phototransformation of the Herbicide Bromoxynil, (3,5-Dibromo)(4-Hydroxybenzonitrile) in Aquatic Systems Containing Sodium Chloride, J. Kochany, et al. Pesticide Losses in Surface Runoff from Irrigated Fields, W.F. Spencer, et al. Physicochemical Treatment: Ion Exchange: Meeting Neutral Effluent Requirements in Modern Ion Exchange Demineralisers, J. Farrar. SelfHeating Hazard in Ammonium Nitrate Removal by Ion Exchange, A. Biskupski, et al. Coagulation, Flocculation and Sorption: The Thermal Regeneration of Exhausted Activated Carbon: The Balance between Weight Loss and Regeneration Efficiency, R.J. Martin, et al. Differential Scanning Calorimetry (DSC) of Exhausted and Non-Exhausted Activated Carbon, M. Baudu, et al. 60 additional articles. Index.